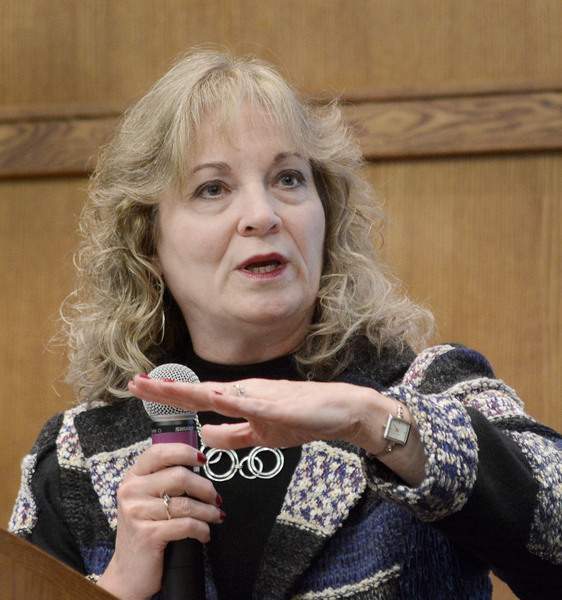 Samuel Hoffman | The Journal Gazette State Superintendent of Public Instruction Glenda Ritz calls for changing the structure by which public school teachers are evaluated. Samuel Hoffman | The Journal Gazette A crowd of about 50 area educators listen to state Superintendent of Public Instruction Glenda Ritz speak at Ivy Tech Community College Northeast. An education panel meeting in Fort Wayne found that there are two reasons for the state teacher shortage: Indiana Senate bills 1 and 575. One ties teacher evaluations to teacher pay; the other took away collective bargaining rights. Shortly after the bills passed in 2011, would-be education students asked questions and started getting cold feet, the panel said. The students asked questions such as: What’s my salary going to look like five years down the road? Why would my pay be tied to students living in poverty, who don’t have a traditional family unit, whose family might be incarcerated, or who may do poorly on the state standardized tests that are the major component in a teacher’s evaluation? 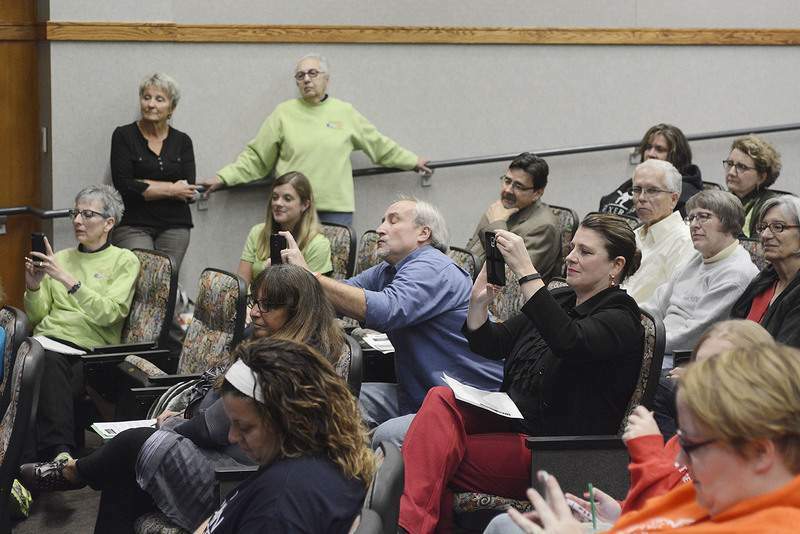 "There are massive amounts of variables," said Joe D. Nichols, professor and former chairman of the Department of Education Studies at IPFW who was one expert on the panel of four Saturday who spoke on the teacher shortage. Students showed "real concern about why are they being evaluated on things they can’t control." The result of asking those questions that also made the rounds on social media has been a plunge in the number of students enrolled in education. Currently, there are 42 IPFW students involved in student teaching, a step on their way to becoming a state-certified teacher. "That’s half of what they would normally be," Nichols said. The panel at Ivy Tech Community College Northeast featured state Superintendent of Public Instruction Glenda Ritz, who is running for re-election this fall. Other panelists were Kathy Carr, director of human resources at Fort Wayne Community Schools; Karin Huttsell, a teacher at Northwest Allen County Schools and a member of the Indiana Department of Education’s Blue Ribbon Panel on the teacher shortage; and state Rep. Melanie Wright, D-Yorktown, elected in 2014. Wright has been a public school educator for 28 years and teaches at Daleville Community Schools, not far from Anderson. Panel sponsors were Indiana Coalition for Public Education and the Northeast Indiana Friends of Public Education. With a teacher salary structure thrown out in favor of yearly stipends based on students’ performance on state standardized tests and other criteria such as a district’s graduation rate, teachers do not have a reliable pay schedule, Wright said. Ritz, a Democrat challenging the Republican-led changes made in 2011, is trying to change the evaluations to include measures of a students’ progress. Teachers already know who is going to pass the standardized tests, Ritz said. It would be better to evaluate based on student progress through formative assessments given every few weeks, she said. That kind of change could also affect a school’s grade. The A-F accountability structure that awards a school and school district with a letter grade tends to punish the poorer demographic, Ritz said. Changing the structure for evaluating teachers would bring equity to Indiana public education, she said. This year, Ritz created the Blue Ribbon Panel on the Recruitment and Retention of Excellent Education, reporting an 18 percent drop in the number of initial teacher licenses issued over the past five years. The Blue Ribbon Panel will conduct a hearing in the General Assembly on Oct. 19.